There are no major changes to report in areas affected by flooding in the midwest area so far this evening. Motorists have been warned to exercise extreme care in driving through flood water, even if it appears to have begun to recede. 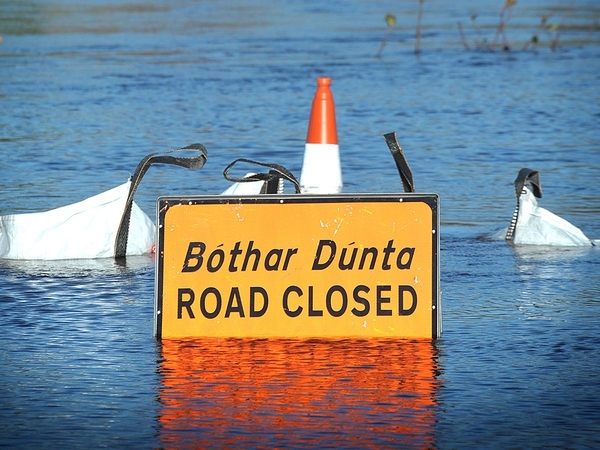 The Chairman of the Government's National Emergency Response Co-ordinating Committee, Seán Hogan, issued the warning after reports of people in 4-wheel drive vehicles trying to drive through flooded roads. He said the side of the roadway may have collapsed, and the damage may not be visible. Speaking after a meeting of the committee, Mr Hogan said the picture nationally remained largely unchanged - the weather offered some respite today, but even without further heavy rain, it could take two or three weeks for the excess water in the Shannon to drain to the sea, going by previous floods. The ESB has said water levels now stand at a record high in Lough Derg. The company says that, consequently, it would have to release more water at Parteen Weir on the River Shannon, which would increase flood levels downstream by about 10cm. The ESB says that a slight fall in water levels was detected downstream this morning in a number of locations. Senior Engineer Donal Brennan said people in flood prone areas from Montpelier downstream to Limerick City should familiarise themselves with evacuation procedures, as outlined on the OPW's website and health advice from the Health Service Executive. So far it is estimated that over 1,500 people have been forced to leave their homes because of the flooding across the south, west and midlands since last Thursday. Several families have been forced to leave their homes in the lower Shannon region today as a result of rising flood levels. Limerick County Council confirmed that water levels along the Lower River Shannon rose by approximately two inches since 10am. 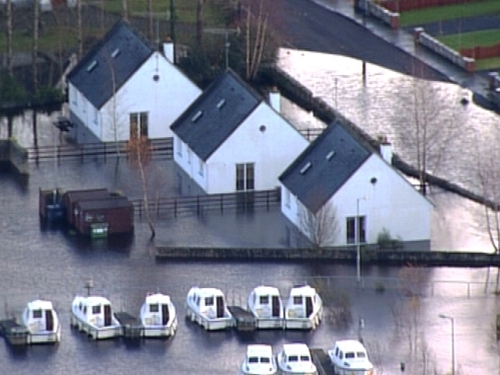 Local authorities have recommended that all residents of Meadowbrook housing estate in Castleconnell should consider leaving their homes due to the rise in water levels today. Limerick County Council say as of last night 14 houses had already been evacuated from the Castleconnell, Montpelier and Mountshannon Road area of Annacotty. 100 residents in these areas are being regularly briefed by council staff and emergency services in relation to possible further evacuations. Meanwhile, three families were also forced to leave their homes in Carron and Tubber in North Clare today due to rising water levels. This morning, the ESB announced that it would be increasing the discharge level of water at Parteen Weir and this would have an impact on flood levels downstream. The Taoiseach has visited areas of Offaly, Westmeath and east Galway this morning to see the extent of the flood damage to homes, farms and businesses in the region. Brian Cowen said emergency services were working well on the ground and that the situation was being monitored on a day-by-day basis. Farmers whose lands are flooded called on Mr Cowen to put a proper maintenance programme in place. A number of angry residents confronted the Taoiseach in Athlone and accused him of doing a quick walkabout without coming face-to-face with the reality of the devastation on the ground. Elsewhere, the Clare crisis management centre has advised that the old Cratloe Road, also known as the Wood Road, has been closed. The Clare Crisis Management Centre has received confirmation from the ESB that they will not be releasing any additional water from Parteen Weir this evening. The army remain deployed in Ennis and South East Clare to assist agencies in the flooding response. The Coast Guard is on standby to assist with operations. Gardaí in Limerick also say that the only access to Castleconnell is at the N7 via Daly's cross. Flood waters are rising slowly in Co Galway and the area between Gort and Ardrahan is still on high alert. Today families who have been returning to their abandoned homes for the first time by boat and tractor say the losses they have sustained are far greater than they had imagined. The IFA organised a meeting of farmers in Gort last night. The Association will be making three drops of fodder in the areas in Galway worst affected by the flooding crisis. The fodder will be brought to Gort, Ballinasloe and Banagher and distributed through the IFA branch structure to farmers. IFA President Padraig Walshe thanked those from around the country who have generously provided and offered fodder. Cork County Council has lifted it boil water notice on the Innishannon Water Supply Scheme, which supplies water to the following areas; Rigsdale, Faranhow, Crossbarry, Upton, Rising Sun, Dunderrow, Summercove and Kinsale. A boil water notice still remains on the Ballinees, Clondrohid and Inchigeela schemes until further notice.